Not sure I can top the Saturday night run in the rain, but I have had some good workouts this week. Sunday I went for a six mile run over the Ben Sawyer Bridge to Sullivan's Island. The sun was setting as I crossed the bridge. On my way back I stopped for a few seconds and just took in the beauty. The clouds looked like they were exploding. It was such a cool site. Monday morning I got up and went to Boot Camp. Crazy workout! We ran across the street to the parking garage (because the huge gym and roof would not do for the Marines). We split up into ability groups and ran up eight floors. On the top level, our group broke into two groups. One group ran clockwise and the other ran counter clockwise (one circle inside the other). When one group stopped to do exercises (mostly abs) the other group ran. We switched every other minute. Then we would run down the stairs and back up the stairs. We did this for the entire workout (my abs are still hurting). Monday afternoon I went for a six mile run in the Old Village to the Old Pitt Street Pier. That place is so incredible. When I got to the turnaround spot I looked to my left and saw the Ben Sawyer Bridge and on the right I saw the Cooper River Bridge. They seemed so far away, but I had run on both of them the last two days. My legs were pretty tired from the morning workout so I took it easy on this run. Wednesday morning I did a group run. 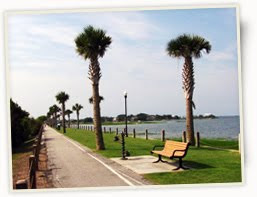 I signed up for the Palmetto200 (a 200 mile relay in South Carolina from Columbia to Folly Beach). We have two groups of twelve runners and are going to be doing a lot of group runs. I am really excited about the training and this crazy race. Anyway, it seemed like there were over thirty people on this run. We started as a large group and then broke up into three ability groups (there were eleven people in my group). The run was five miles. The first mile was a slow warm up. The middle three miles were speed play. One runner would pick an end point ahead and we would sprint to that spot. We would then run at a recovery pace and the next runner would pick a spot and we would sprint to it and then recover. This went on for the entire three miles. We then finished with a one mile cool down. I loved this run. It was the first time I had done it and it was very different than a long distance run, a steady run or a tempo run. Just what I needed to break up the typical training. Seventeen miles and a Boot Camp, not bad for the first part of the week.